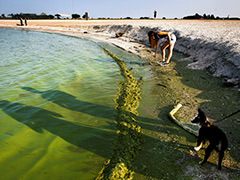 The city of Toledo, which was one of the main affected areas, declared its water safe to drink again on Monday, ending a two-day ban that many believe resulted from pollution that fosters the presence of algae in Lake Erie. Toxins found in the lake were treated with chemicals that worked to bring algae levels back down to normal, thus closing out the water scare. Thankfully, the area reported no serious illnesses resulting from the water, despite the fact that the potential symptoms from drinking the contaminated tap water included cramps, vomiting, and rashes. Denizens of the area were instructed to avoid the water altogether, with local governments discouraging boiling the water or using it for cooking or hygienic purposes like teeth-brushing. When the ban first lifted, the affected areas were told to flush out their systems by running water, and to refrain from heavy water use all at once. Many people remained skittish about drinking the water even after the ban. After the ordeal, Ohio governor John Kasich announced that the state would be examining Toledo’s water system and reviewing the possible causes for the contamination. Toledo’s mayor, D. Michael Collins, brought closure to the scare by gulping down a drink of local water and announcing an official end to the ban, declaring that the water tasted great. Posted on August 11th under Pollution Reduction.